While in Cologne we figured out three trends: (1) retro turns sophisticated and dark, the omnipresent pale rosé – copper – grey colour combination of last year moves into a (2) range of reds and is contrasted by trying out some (3) watery blue shades. The dark retro was most visible @Baxter, @GALOTTI @ RADICE and @ MINOTTI. The retro elements are turning out a bit more sophisticated and look like from a mid-century southern californian villa. Maybe retro as a “novelty” has worn out and the quoting of retro shapes and colours now blends better into the rest. The red tones start with burnt orange and range into dark reds and berry tones. These warmer reds are combined with darker woods and black – apart from the never changing greys. We also noted that watery blue shades where visible on some stands: a light blue bed @TOM TAILOR, a series of blue shades in leather @ROLF BENZ and this reminded us of the near classic glass table “bell table” @CLASSICON by Sebastion Herkner, now also available in green-blue glass. 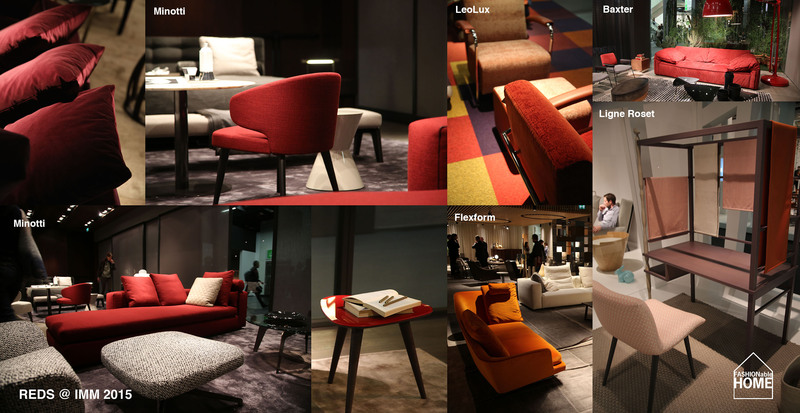 This entry was posted on February 11, 2015 by Chef de Cuisine in Fairs and tagged Cologne, Colours, Furniture Trends, IMM, IMM 2015, trends.